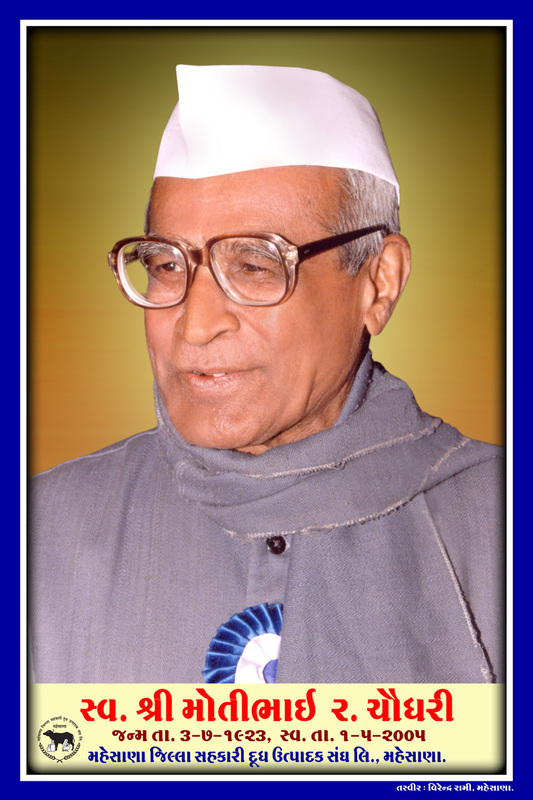 Motibhai Chaudhary was born on 3rd July 1923 in former household at Manekpur village in Vijapur taluka. He had limited access to education but was blessed with qualities of enormous common sense or (wisdom) and self confidence .He promptly joined the ‘Sevadal’ in the year 1948 to actively participate in the post independence public motivation programme / drive initiated by Mahatma Gandhi. He was then elected as the member of the legislative assembly and held the portfolio of the Ministers of transport in the state government .His unmatched wisdom, stingy attitude and noteworthy administrative skills enabled him to successfully lead the ‘Dudhsagar Dairy’ for a record span of 35 years from (1970 to 2005) as chairman or beloved Bapu as he is fondly addressed by the employees of the Union. He was elected to the Parliament for Agriculture, Dairying, and Rural Development and successfully resolved many problems of his constituency. He provided a number of directives for the economic growth of the nation. After a short spell of the illness he passed away on 1st May 2005. Vipulbahi Mansinhbahi Chaudhary illustrated son of the Founder Chairman of Dudhsagar Dairy has taken over as the Chairman of the Union. He is a graduate in mechanical engineering. At an early age of 28 years he has successfully handled ministerial portfolios in the State Government. His contributions to the progress of the Union, his ideas and beliefs in simple living and high values, all continue to inspire us in our activities.